UNITED STATES: The family of an Australian woman killed by US police after making an emergency call is complaining that authorities have left them in the dark about how the shooting happened. Justine Damond was killed late last Saturday (July 15) by a police officer responding to her emergency call of a possible assault in an alleyway near her home in Minneapolis, Minnesota. 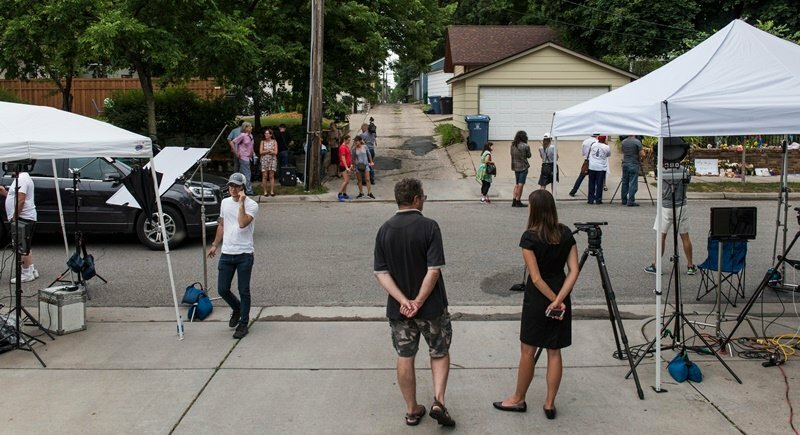 The Minnesota Bureau of Criminal Apprehension, which is investigating the shooting, has said little about the case, even as demands for answers intensified. The bureau planned to release more information after interviewing the two officers involved in the incident. The medical examiner’s office conducting the autopsy said Ms Damond, a 40-year-old meditation and life coach who had moved to Minneapolis to marry her fiancée, died of a gunshot wound to the abdomen. Ms Damond had changed her last name from Ruszczyk after leaving Australia, where her father John Ruszczyk yesterday (July 18) called for justice. “Justine was a beacon to all of us. We only ask that the light of justice shine down on the circumstances of her death,” he said, reading a prepared statement during an emotional news conference. Ms Damond had called Minneapolis police Saturday around 11:30pm to report “what she believed was an active sexual assault occurring nearby,” her fiance Don Damond told a news conference Monday (July 17). “Sadly, her family and I have been provided with almost no additional information from law enforcement regarding what happened after police arrived,” Mr Damond said. Authorities said they found no weapons at the scene of the shooting, confirming reports that Ms Damond was unarmed. “I understand why so many people have so many questions at this point,” Minneapolis Police Chief Janee Harteau said late Monday in her first public statement about the case. “I have many of the same questions and it is why we immediately asked for an external and independent investigation,” she said, adding that she has requested an expedited probe. Ms Damond was reportedly shot while in her pyjamas, after walking to the driver’s side of a police car to talk to one of two responding officers, according to the Minneapolis Star Tribune newspaper, which quoted three anonymous sources. In addition to why Ms Damond was shot, authorities are probing why the officers’ body cameras were turned off during the incident. All Minneapolis police are outfitted with such cameras. The officer who shot Ms Damond was identified as Mohamed Noor, a 31-year-old Somali American who joined the force in 2015. His attorney Tom Plunkett released a statement saying the officer took “these events very seriously because, for him, being a police officer is a calling”. “He joined the police force to serve the community and to protect the people he serves. Officer Noor is a caring person with a family he loves and he empathises with the loss others are experiencing,” Plunkett said. The officer cannot say more about the case due to the investigation that is underway, the attorney added. The weekend shooting was the latest involving police to rock the Midwestern state. Most of those have seen African Americans shot by mostly white police. The fatal shooting of motorist Philando Castile last year during a traffic stop sparked outrage and protests. Police officer Jeronimo Yanez was acquitted of manslaughter in the case, prompting renewed demonstrations. Mr Castile’s family received a $3 million (B100.98mn) settlement to avoid a federal civil rights lawsuit. From what I read, the only gun was that of the policeman. It's the USA where guns are revered. What else can you expect?